Edgar Allan Poe was an American writer, poet, editor and literary critic, considered part of the American Romantic Movement. Best known for his tales of mystery and the macabre, Poe was one of the earliest American practitioners of the short story and is considered the inventor of the detective-fiction genre. One of his most famous work is "The Raven." It is a poem telling a story of a man's mourning and loss. Other works include "The Tell-Tale Heart" and "The Cask of Amontillado. 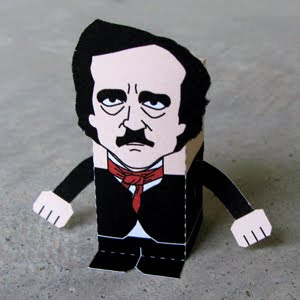 Download the PDF file here and make your own Poe!